The contractor finally got the pot rack hung. We understand it was a bit of a challenge because the bolts were handmade and weren't standard sizes. The pot rack is very well made and was a good deal when compared to ready-made pot racks from the kitchen stores. We were practically sold on it when we learned the blacksmith lives in Portland, Oregon! If anyone else is interested in obtaining a pot rack like this one, it was made by Yardley Forge. Shasta is about to be a very happy dog child. 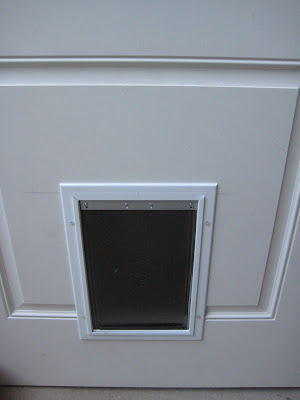 We have a dog door! Now we just need to replace the side fence so we can keep her (and the chickens) in the backyard.